First, there were no Korean people making this food. It was sub-par...just because you throw a few sesame seeds on top of the food, doesn't make it Korean! And they put cheese on my salad....Koreans are lactose intolerant! Also, the menu said it would cost me $10, but they charged me $11. Plus, the bulgoghi doesn't even taste like bulgoghi....it tastes like American beef. As a Korean, I was thoroughly disappointed! Overall ok and worthy of another try. The good; taste was good, nice size portions. The bad; a couple of nit-picks. The on-line menu is dated and the box now costs $10 + $1 in tax. Also, the pork is "cut" with clear noodles so 1) you are getting less pork, 2) you already have all that rice, do you really need more carbs? The suggestion; serve the pork on top of the rice vs side-by-side, all that tasty sauce can catch in the rice vs the bottom of the container. The good is nice size serving of pork which was good but not spicy. The rice though nice and sticky, and the dumplings were great with their dipping sauce. The bad (and some of this is pretty nit-pick), their posted menu & costs is different then the one online. K3 is suppose to be $8 vs $10 + $1 tax. The pork serving was good size, but they cut it with clear noodles (not listed on the menu)...with the rice already, noodles are not really needed. Serving wise, it would be better to put the rice down and the pork on top vs side-by-side. Overall fast, good and worthy of another try. I almost cried tears of joy and died from happiness at the same time! BUY THESE TACOS! Excellent lunch portion. Really nice fresh vegetables, perfectly cooked rice, tuna was good. I could have been on the streets of Seoul. Overall winner. Tried the bimbibap bowl from Kimchi truck today-it was wonderful. You get a small portion of rice, the meat of your choice, plus two kinds of lettuce (field greens and romaine), carrots, cabbage, avacado, corn and cucumber, along with sauce for the dish. The egg on top is optional, but recommended. The flavors were great, the veggies fresh and crisp. Definitely a winner. Excellent tacos. Good bulgogi and spicy pork. They use real kimchi made from Nappa cabbage (though i would prefer it a bit riper). They also have Sriracha sauce available. Next time I will get extra spicy. Tacos--crazy amazing and complicated flavor! I've been back at my desk from lunch for half hour and the awesome flavor is still there! (better go brush my teeth) I got the 3 tacos/$8: 1 bulgogi + 1 pork + 1 chicken. Ordered standard menu way, but will try substituting different kimchis next time. These are very similar to Far East Taco Grille truck. Hard to choose--love them both so I alternate. The $5 for 6 dumplings here are a bargain, but they didn't blow me away. Decent side dish with something else if you're hungry. The tacos are UNREAL!!! The bibmbop slaw is AWESOME!!! Everything blends so well together and is extremely flavorful! Never heard of Kimchi inside dumplings, but is FANTASTIC!!! 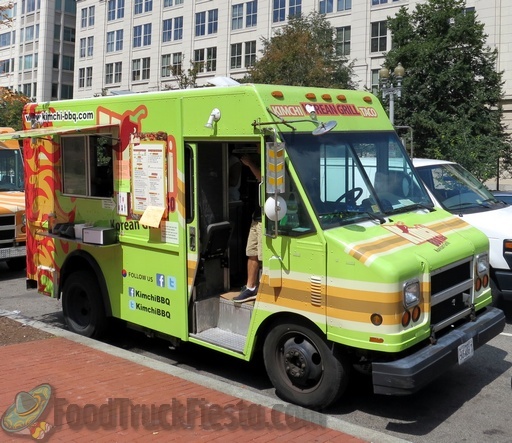 Just discovered this truck 2 weeks ago and have been 3 times, and I only go to DC once or twice a week!!!! This was pretty delicious! So much flavor wrapped into 3 little tacos! I have taco lids right now. I need a nap. Kimchi BBQ Taco is a Korean-fusion truck that launched on Nov 29, 2011 in DC. The plan is to serve lunch in DC and dinner in Tyson’s Corner, VA.